PDFelement - PDF editor on big sale! 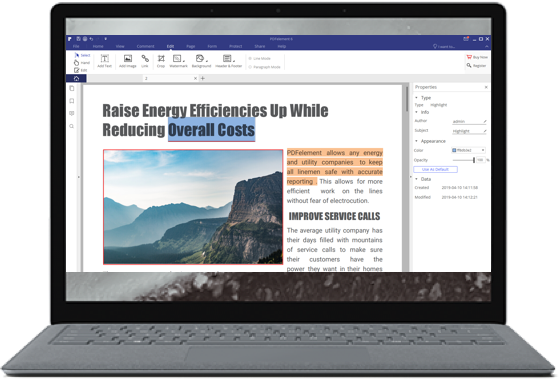 With intuitive design, robust features and affordable price, PDFelement offers the most sophisticated, yet easy-to-use PDF editing features for you in Windows and Mac! Form field recognition and Create fillable PDF form. Remove password protection on PDF copying, editing and printing with ease, making it free to use PDF files. Convert PDF documents to Word, Excel, PowerPoint, EPUB, HTML and image formats with OCR. Convert standard PDFs to Excel, Word, PowerPoint, HTML, Text, ePub and image formats. No OCR included. Convert PDF to Microsoft Word formats, preserving the original PDF formatting and layout in the editable documents. Convert single or a batch of PDF files into Microsoft Excel spreadsheets. Easily extract and repurpose your data. Turn PDF files into Microsoft PowerPoint presentations while maintaining the original tables, graphics, hyperlinks etc. Change PDF files into popular eBooks format – EPUB, enhancing your reading experience with mobile devices. Create personalized EPUB books from a variety of source files, including MS documents, images and webpages.